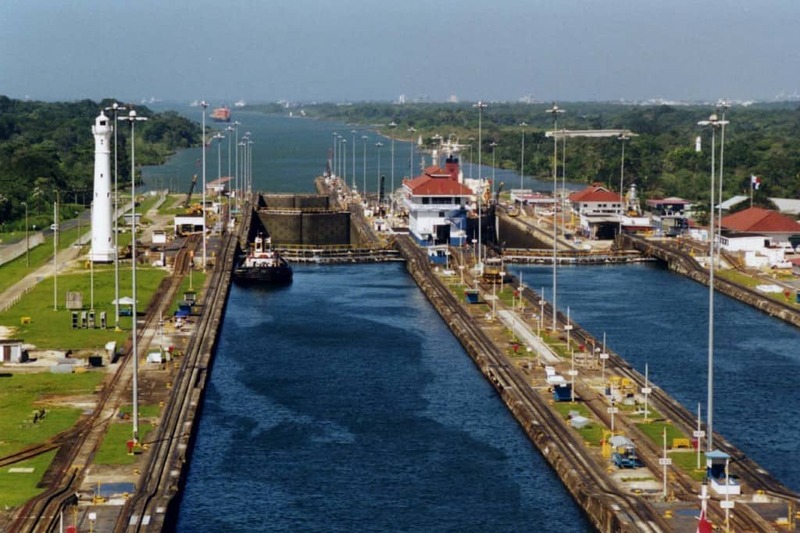 Panamanian nationalists quickly saw the Canal as a symbol and pushed to renegotiate or abrogate the treaty. After the 1956 Suez Crisis, activity accelerated and in 1964, Panamanian students entered the Zone to fly the Panamanian flag next to the American flag. The gesture, which was meant to help defuse tensions, had the opposite effect when American school officials and students harassed the Panamanians and the flag was torn. This led to widespread rioting and the deaths of over 20 Panamanians. Panama then broke off diplomatic relations with the U.S. and demanded negotiations on a new treaty. 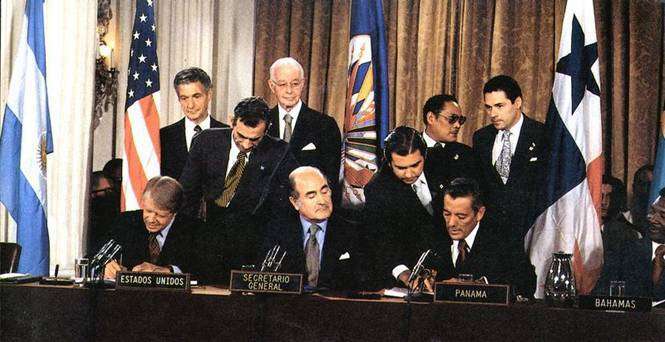 Negotiations over the next years resulted in a treaty in 1967, but it failed to be ratified in Panama. Negotiations were resumed on February 15, 1977 and were completed by August 10 of that year. 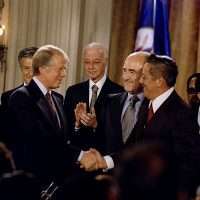 The treaty was signed by President Jimmy Carter and Panamanian General Omar Torrijos on September 7, 1977 in Washington, DC. 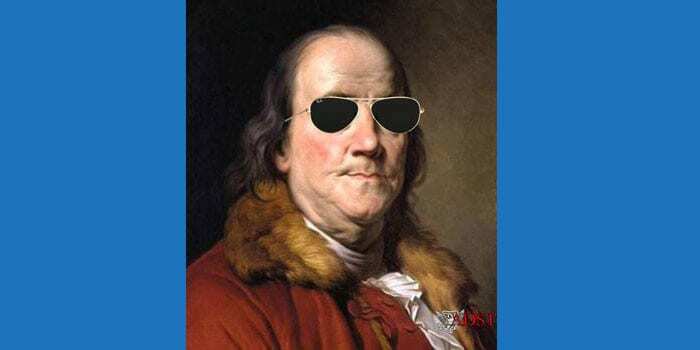 However, the fight for ratification was not easy, given strong opposition in the Senate and with the American public. Senator Strom Thurmond, echoing Roosevelt, rallied his supporters by saying, “The canal is ours, we bought and we paid for it and we should keep it.” After grueling negotiations and a lot of persuasion, the Senate ratified the two treaties, one on the Canal, another on neutrality, by vote of 68-32 in March and April 1978. Legislative assistant Elizabeth Frawley Bagley, who later served as Ambassador to Portugal, found herself heavily involved with the writing of the treaty and campaigning on Capitol Hill for its ratification. She was interviewed by Charles Stuart Kennedy beginning in July 1998. 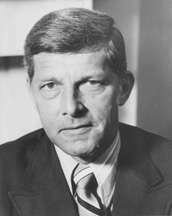 Gale McGee had been the Democratic Senator from Wyoming from 1959-77 when he lost the election; Carter then appointed him Ambassador to the Organization of American States (OAS). He explains the role that he played in ratification; he was also interviewed by Kennedy, beginning in December 1988. Terence Todman, who was at the time the Assistant Secretary to the Bureau of Inter-American Affairs, discusses how he helped inform the American public on the reasons for the treaty; he was interviewed by Michael Krenn beginning in July 1995. You can also read about the 1989 U.S. invasion of Panama and the years preceding it. BAGLEY: This was in 1977. The Carter administration had just come in and was beginning to get settled. My friend called me and said there was a job working on the Panama Canal treaty, a temporary job, but something that might eventually get me into the State Department and he felt he could get the job for me. I went over to the Department immediately, interviewed for the job and landed it partly because of my Spanish, as well as my [Senator Ted] Kennedy connections. It was one of the most fascinating issues of my career. I began in September, 1977. So, I was hired for what was thought to be a six-month assignment but turned out to be three years. The Senate treaties weren’t passed until 1978 and then the implementing legislation brought it to April 1979. It was exhilarating and very demanding. It was my first real substantive role and exposure to the federal government. It was Carter’s very first foreign policy initiative, so every department and agency was involved. It was run at State out of the Office of Congressional Relations. I was assigned as a deputy first to [Deputy Assistant Secretary of State] Bob Beckel, who later went over to the White House as Congressional liaison, and then to [Deputy Assistant Secretary of State for Congressional Relations] Ambler Moss, who is still a very close friend and served later as a U.S. Ambassador to Panama during the implementing legislation fight in the House…. 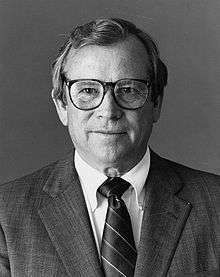 Ambler was assigned to negotiate the Panama Canal Treaties under Ambassador [then a negotiator for the Panama Canal Treaty] Sol Linowitz, who came in 1975. McGEE: The Panama Canal, in terms of an issue, was probably the most important single issue, at least from my perspective, in that whole period because of the sort of grandeur of power, isolationist view, whatever you want to call it. This was ours. We seized it, then we built it, and then it became obvious how strategically important it was…. [It] was [former Secretary of State] Dean Rusk who [insisted Carter get someone from the Senate] and pulled it off….He said, “You need Gale McGee.” Because I had been defeated for a Senate fourth term in 1976. In other words, I was available. If I’d still been in the Senate, they might not have done it, or I might not have taken it. I probably wouldn’t have. With another term in the Senate coming up, I would have gotten great seniority. But given the fact that there I was with the shocks of the campaign of ’76, a real shocker among the predictors, this was the best opening that they had in terms of where I would be the most useful. That was Rusk’s calculation…. BAGLEY: It was the number one issue in the Carter White House. I was at meetings at the White House, the Defense Department and every part of the State Department that was involved. After a while they asked us to go up to the Hill to establish an office. This is quite unique and I don’t know if it has happened since. I was asked to set up the office, S-207, just off the Senate floor. It was right near Vice President Mondale’s office, so we were able to hold meetings with Senators there. It was Ambler Moss and me and [assistant negotiator for the Panama Canal treaties] Mike Kozak…and then was a deputy legal advisor and Colonel Larry Jackley from the Defense Department. At that time the debates were not televised. They had just gotten on to NPR, National Public Radio. We were given a box so we could hear the debate at all times. Whenever there was an amendment, an understanding, or a reservation, I would call the document room right away and they would bring it up to me in our building office. I set up our filing system and tracked all the Senate bills. We would meet with supportive Senate staffers every morning, mostly Democrats, and compare notes and go over our daily strategy. Then the floor debate would begin and I would research the Congressional Record every day. I ended up keeping a catalog of all the major issues, like defense, sovereignty, the economic implications, among others. So, I knew the debate better than anyone else. Then there were amendments, which would violate the treaty, and we would try to work with them to soften the language and make them “reservations” or “understandings,” legislative terms that would not violate the treaty. We were always meeting with the Panamanians at the same time to try to determine what they could and could not live with, and communicating this information back to the White House and the Senate. It was a great negotiating process and I was in the middle of the whole process, absolutely enthralled with my role as one of the “Gang of Four,” along with Ambler Moss, Colonel Larry Jackley, and Mike Kozak…. After visiting Panama and the Canal, [Senate Minority leader Howard] Baker [R-TN, at right] realized how important it was and how truly vulnerable it was and decided to support the treaty which, of course, politically for him was probably suicidal. Baker and Robert Byrd of [West] Virginia, then the [Democratic] Majority leader, introduced a Byrd-Baker leadership amendment, which postponed the giving of the Canal until the year 2000. It was worked out by the State Department and didn’t really change anything but addressed concerns on both sides. He thought he could get people from the Republican side to support the treaty because of this amendment. In fact, there were lots of amendments in the end sponsored by Democrats, like the freshman Senator Dennis DeConcini [D-AZ], and we had to compromise with them on various languages and often refer to back to the Panamanians in their approval if it made a significant change. Every day the “Gang of Four” would meet with the Baker people and talk about the day. That proved to be extremely valuable because we were not the White House, we were the State and Defense Departments, and it brought Colonel Jackley along because he was then able to understand what it meant to compromise. Politically I think they all understood what it meant, how difficult it was for Senator Baker to convince his Republican colleagues, and what needed to be done. So we really analyzed the debate every day, discussed strategy, and worked with them throughout the debate. Of course, Baker was the leader and we deferred to him, but it was a wonderful exercise in bipartisanship and proof that especially in foreign policy, politics should stop at the water’s edge. I was the only female, just 25 years old, so [the nickname] was meant in jest and as a sign that I was an integral member of the team…. I would have to call in my reports at night. When we were on the Hill, it was so intense and went on after midnight, so I was pretty much relieved of doing any written reports except to do oral reports. What I was doing was really running a campaign. It was fabulous. I think it was an awakening for all of us who spent our days and months in that little office because we gained invaluable insights into the legislative process and the importance of their work. Colonel Jackley became a great defender of the political process and of the Hill after working with us. We would fax proposed compromise deals with various Senators to DOD [Department of Defense] and State for clearance. Senators were always wandering into the office and I would be in the middle of all the discussions on compromise language and strategy. Senator [Paul] Sarbanes [D-MD] came in quite often. Not only did I have the “deals book” but I knew all the debates because I was researching them. Every day I would go home and go through the Record with my marker. So, it was kind of an exercise in future legal research because I was really learning a lot about the workings of the Senate and the myriad of issues that the Senators had to grapple with every day…. We would also have regular briefings at the White House for senators. 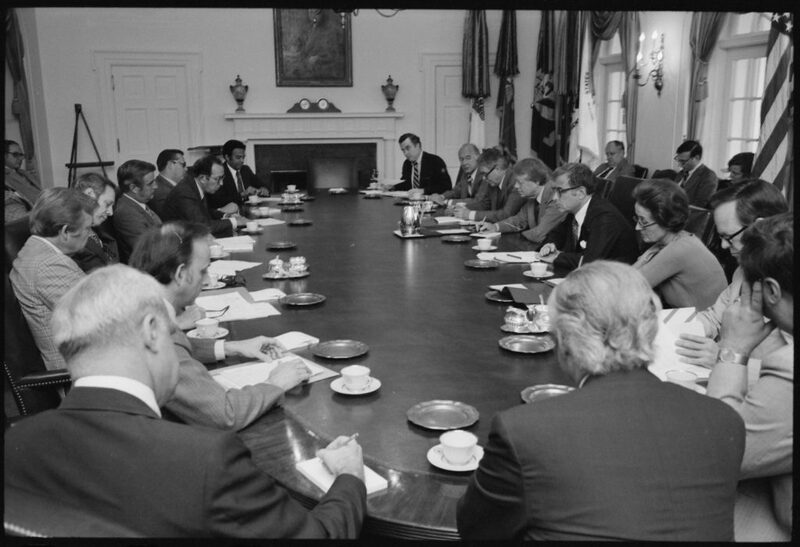 President Carter would be there along with the Chairman of the Joint Chiefs of Staff, the Vice President, the Secretary of Defense and the Deputy Secretary of State, Warren Christopher, was actively involved because Vance was working on SALT [Strategic Arms Limitation Talks with the USSR] at the time and had turned Panama over to his deputy. The President would start off to introduce everyone and then he would go into minute detail on every phase of the treaty. I remember being very impressed but also thinking why is he doing this when he has everyone here and they all had things to say. He spoke for an hour and then asked for questions. All of the questions were directed mostly to him and he would answer them. So, I would think to myself, “Isn’t it wonderful that he knows all this, but why does he need to know all this?” It was my first sense of recognizing that he is an engineer and a micro-manager who is engaged in the minutia instead of the big picture. I think that was a real problem with his presidency. He didn’t really have a relationship with the Congress; he had very little with Senator Byrd, the Senate Majority leader, and none with Baker. As far as I could see he really didn’t understand the politics of the treaty. He knew the policy like no one else, but, while that is very impressive to have that kind of information at your fingertips, he didn’t need it. He was there to be inspiring, and he was lecturing them instead. In the presence of Reagan or Clinton, you felt like you were with the “President,” but when I first met Carter, I found him to be a nice, sweet man but not charismatic or an awesome presence. That hurt him on the Hill because he didn’t like to engage in the give and take of legislation, and as a former governor, he had little experience with the legislative process. And there was a lot of this talking to make sure that things would keep moving. And when the treaty was finally approved, signed, and it came time for ratification, we counted the Senate votes and we knew that we didn’t have the votes to get ratified. And I developed, together with Peter Johnson…a plan for making sure that the American people got to know what this was all about. Not propaganda, but explaining what it was. And we took a map of the United States, looked at where the votes were and where they weren’t, who was on the fence, who was against unalterable, who was in favor and we decided to go out and hit all the people who were on the fence. You know, just thank you to those who were in favor, and look at all the fence-sitters. And we organized a massive campaign of public information, public speaking. And I went around myself and spoke in many places around the country, to groups, gave interviews to newspapers, on radios, took people’s questions–”What is this thing all about”–to try to insure that the American people knew what it was we were doing. And the votes changed. We got enough votes changed and we got the treaty ratified. So I was in on the formative stage, with a great deal of conversations that were not critical within the formal negotiating session. And I know that getting some of these things changed was critical, because I could then go and talk about them. And then I was involved again finally at the end, just before ratification. [His argument was that] we can’t give it up. This is ours. The audiences, to start with, were a little cool, but they warmed up very rapidly as more and more information came out on this. They got a lot of people into the field, finally, making speeches, but no one got anywhere near my exhaustion…. The question was, less important, “Who owns it?” If you owned it and it was closed, it wasn’t very valuable real estate. How do you keep the canal open? It’s our greatest strategic linkage. And they bought that — finally…. Anybody could close the canal with a little care or preparation…. There was an organized opposition [in the Senate] and it was the more conservative senators. Dole epitomized that. He was the new youngster in the Senate, but leaning to the right, Bob Dole, Senator from Kansas. But he agreed to take that post because the conservative Republicans didn’t want to get caught on that in the sense that there would be a lot of flak. They knew that. As a matter of fact, a couple of them whom I’ll not name told them that they were going to support the treaty right away. They were telling me that, but said, “Don’t break the confidence.” And I haven’t broken a confidence. But they were two very strong Republicans. So Dole was kind of caught betwixt and between. So Dole said, “She just told me, ‘Robert, dear, when are you going to wake up? You follow Gale McGee and you’ll stay out of trouble. '” This is what she told him right there. We’ve often laughed about that since. BAGLEY: In the end, it was the Democrats’ sense of loyalty and the Republicans’ belief in the issue that won the day…. The White House ran it very effectively, although we all had very good relations with the White House people, who were mostly political. They were mostly on the Hill as well, operating out of the Vice President’s office. They would meet every day with the Senate staffers. There were several of the Southern senators who were not on board. I remember Wendell Ford [D-KY] was not on board. I remember his Senate staffer was a woman, very bright, who would come to every meeting and feed the information to him and prod him along. He ended up voting for it in the end, but it wasn’t until he exacted certain concessions for his vote. We kept a list of leaning for, leaning against, for, against, undecided, and would try to get them on board. We started off with not enough and ended up with 68 in the end. Byrd ended up convincing his West Virginian colleague, Senator Jennings Randolph, a real conservative, who was our last vote, so we got one more than the two-thirds needed…. They passed the treaty in April of 1978. There were actually two treaties considered together. We passed the Panama Canal Treaty and a second treaty called the Neutrality Treaty. I can’t remember why they were divided because they were part and parcel of each other. We waited the summer and then started implementing the legislation. There were a lot of things that dealt with the bases like Social Security and the return of assets, etc. There were several Congressional committees. The Post Office and Civil Service Committees, and a Panama Canal subcommittee (run by Rob Bowman) of the full committee run by Representative Jack Murphy, who was the Chairman of the Merchant Marines and Fisheries Committee. When Ambler Moss became ambassador, I started organizing Congressional delegations, or CODELS, to Panama and became the institutional memory for the treaties at the ripe old age of 26! I remember going down to Panama with Chairman Jack Murphy, a conservative Democrat from New York, and Rob Bowman, a right-wing conservative Republican from Maryland, and going to mass, the three of us! Although we agreed on very little, we were able to find common ground somehow and I think it helped in our negotiations over the implementing legislation. I have never found a person that you can’t somehow relate to on some level, and I think that is key to working in politics.